With my mind on my money, and a wallet as my mind? Spending around the holidays gets a little crazy for most people, and if you’re one of those unlucky folks who are now heading into the new year with a few bad sweaters, some tube socks, and a pile of bills, then one of these new wallets just might help. 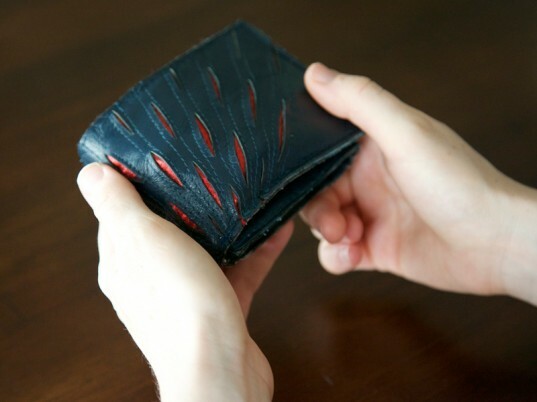 Designed to create a tangible element to online spending, which on its own can often seem without consequences, the wallets come in three different styles and each have a unique method of reminding you to slow down on eBay or etsy when you need to. They can connect with your smart phone using Bluetooth, so your bank account info can be monitored in real time, which provides an accurate indicator of how much you really should pay for that issue of T.O.F.U. Yes, I had to go there. How else will I ever be able to even open one of these wallets if I don’t plug my own product? Comments Off on With my mind on my money, and a wallet as my mind?